Check out this extract from Tony 10, one of the year’s most acclaimed Irish sports books. THE FOLLOWING PASSAGE is an extract from Tony 10: The astonishing story of the postman who gambled €10,000,000 … and lost it all by Declan Lynch and Tony O’Reilly. They come down again in the middle of December, the auditors. Two men in his office, two on the counters. They will surely find him out this time. He knows they’re going to get him. He is sitting at his desk in his office while the team sets about its business, and he knows for sure that at some point they are going to find this €294,000 that should be there, but that isn’t there anymore. They have come down from Portlaoise in the bad weather. He had a vague hope that a major fall of snow might save him today’s ordeal. The weather is horrible, but it is not horrible enough to stop them getting to Gorey and setting about their task, while Tony 10 sits there, trying to look unconcerned. He is sick with the fear. He is just waiting for them to get to the part where they discover that €294,000 is missing, and then he presumes he will end the day – end his life as he has known it – being led away in handcuffs. is really not worth doing at all, but he decides to do this thing anyway, maybe from some primal instinct of self-defence in the face of overwhelming odds. Or maybe just to pass the time doing something other than waiting. He goes to the toilet. He needs to go to the toilet anyway, because of the sickness that is running through him, but he has this other reason, too, for absenting himself. While the auditors are checking the cash, on the quiet he takes two Accountable Receipts (a.r.s) from a cupboard, thinking he might doctor them in some way before they get to them, a hope so forlorn that when he reaches the toilet and closes the cubicle door behind him, the first thing he does in this haze of fear and panic is to take out his phone and to send a text to Fiona: I’m sorry. gambler’s imagination, not in the casino at Monte Carlo or a private box at Ascot – just here, locked in this cubicle, in the most appalling trouble, the adrenaline running madly as he is sending the text, knowing that it cannot be unsent. I’m sorry. The arrival of this onto Fiona’s phone will surely, all by itself, start a process of disclosure that will lead to the end of this insanity. ten times bigger, trying in the most basic way imaginable to conceal his losses. Part of him would like to throw away the pen and come out with his hands up, to give up this wretched pretence. Again he has this sense that, along with the ruination of his life, there is some kind of a black farce being played out here too, with this changing of the figures reminding him again of Lloyd Christmas in Dumb and Dumber. to know that this is futile, and that he is doomed. Yet he still proceeds with the task of falsification, driven not by any rational energy, just by some primitive rush of desperation. Gambling wildly that this might somehow postpone the inevitable day of judgement. The despairing task completed, he tries to keep these new numbers in his head as he rejoins the activity in the office, sliding the a.r.s back into the cupboard and using the computer at his desk to bump up the figures in accordance with the changes he has made – to ‘balance’ these fictional books. Somehow he makes the numbers on paper match the numbers on the computer, and somehow, astonishingly, he gets through this audit too. He thinks he may have got lucky in a couple of ways. Some very large investments had come into the post office that week, perhaps drawing attention away from other figures. And he wonders if the bad weather was in his favour too, he imagines the auditors being slightly distracted from their task by the prospect of driving back to Portlaoise on icy roads. In truth, he doesn’t know how it happened, except that it did happen, and now he remembers that he sent that text to Fiona. I’m sorry. He has told her he is sorry, but he has not told her what he is sorry about. He has the drive home to figure this one out. He is so broken down by it all, so utterly shattered, he wants to tell her the whole story. But he has been keeping this thing to himself for so long, he just can’t let it go. Even in this most desperate situation, there is still some notion in his head that he can still get out of this – that if he can hide €294,000 from the auditors in the way that he did, it mightn’t be completely beyond him to pick the few winners that would complete the job for him. 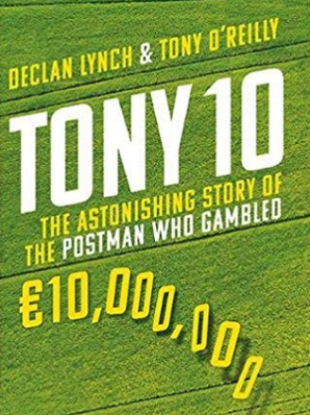 Tony 10: The astonishing story of the postman who gambled €10,000,000 … and lost it all by Declan Lynch and Tony O’Reilly is published by Gill Books. More info here. Email “'He is sick with the fear... Waiting for them to get to the part where they discover that €294,000 is missing'”. Feedback on “'He is sick with the fear... Waiting for them to get to the part where they discover that €294,000 is missing'”.